If you feel like more of a city break over the typical sun, sea and sand holiday in Phuket or Koh Samui, I’d recommend staying in the shopping district of Siam, Bangkok. You are simply spoilt for choice with countless cute boutiques stocking local designs and labels – basically a whole load of stuff you won’t have seen before. Personally, I come to Thailand for accessories, because I find that most Thai labels have a fresh and edgy take on accessory design that you don’t really find elsewhere in Asia. One of my newest discoveries is accessories label MOSSTORIES. I’d actually come across their necklace designs at Blueprint Trade show & Emporium earlier this year in Singapore, so when I stumbled across the store in Siam the name jogged my memory and I had to pop in and take a look. First established in 2006, MOSSTORIES started off as a handmade jewellery brand. 7 years in, the designer and creative director, Moss Chatkeo Srisuwan, is continually inspired by urban living, fashion & the arts to create individual pieces that tell a story. What I love about MOSSTORIES designs (the label carries jewellery, bags, shoes & a small fashion line) are the combination of angular shapes and modern materials. For example, the latest accessory collection, Geometric Blossom, features block colours and PU leather in interpretive shapes of flowers & butterflies. 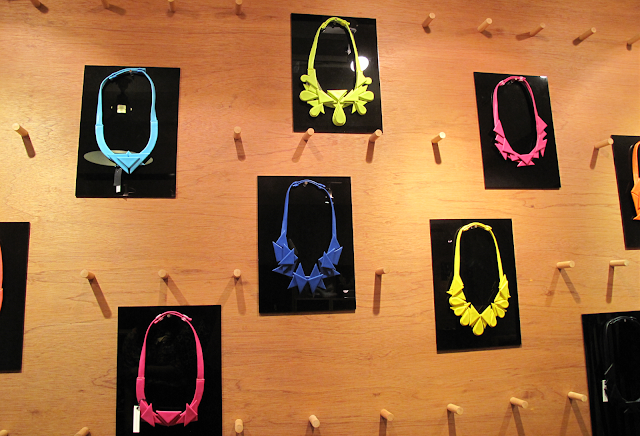 The necklaces also feel extremely light to wear, despite being rather large statement pieces. The result? Exceedingly wearable and versatile costume jewellery pieces. Shoes from MOSSTORIES are simple but well done, a detail I appreciate as such designs can actually be quite hard to come across these days. Interestingly, designer Moss didn’t actually start off in fashion, but in drama. In 2008, intent on exploring her interest in design further, she attended LCF on a footwear course, and started from the ground up. 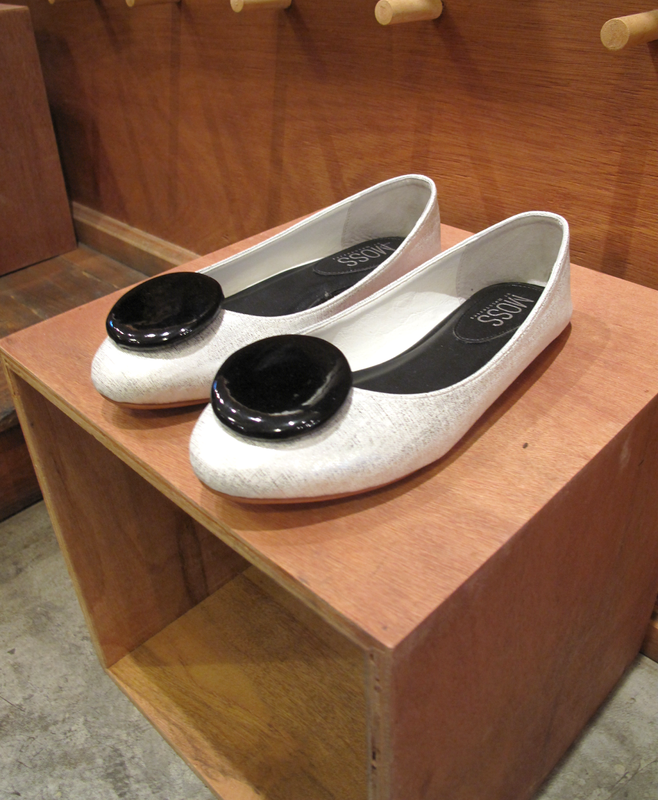 She took this knowledge and started her own shoe and bag collection, in addition to the handmade jewellery. Originally, I had no idea that MOSSTORIES stocked footwear, because they’d only exhibited their necklaces at Blueprint. I’m pretty sure my wallet wishes I hadn’t found this out, as I walked away with two pairs that day! **A small side note for fashion travellers – ‘Soi’ means a little side street in Thai. SUCH a cute word. Just one of the pairs of sandals I walked away with! These necklaces are SO gorgeous! I absolutely love the geometric shapes and bright neon colors. The third photo – earrings? If so, super cute! Yes! Earrings. They're surprisingly very light.